Q: What is a typical day like at camp? A: Camp days are packed with many different activities and opportunities for learning, fun, and making lasting camp friendships. Some of the favorite camp activities include gaga ball, archery, low ropes, arts & crafts, swimming, and zip line. For a more detailed daily schedule, click here. A: Yes, please read more about financial aid here. A: When you arrive with your camper, everyone meets with the camp dietician to review any food allergies or dietary restrictions. The dietician works with the Kitchen staff throughout the session to make sure food allergies are accommodated as appropriate. For more information, please see our Food and Nutrition Policy here. Q: What diabetes supplies should I pack? A: Camp Nejeda supplies all blood glucose meters, test strips, low snacks, and most insulins. Our camp counselors carry meters and low treatment with them, so campers are able to go from one activity to the next without having to carry supplies around with them. If your camper uses an insulin pump, CGM, injection aid, or REUSABLE insulin pen, please bring these with you (disposable pens as well as insulin cartridges are both available at camp). For a full packing guide of all suggested items, click here. Q: How do campers and parents communicate while at camp? A: Campers are encouraged to write letters and postcards to parents and other family members as often as they would like. Mail goes out daily and the campers have a period during the day to rest, read, and write home. For younger campers, having pre-addressed envelopes and postcards is helpful. Since we do not sell stamps at camp, it is also important for parents to supply postage. Parents also are able to send letters and postcards, packages, and emails. 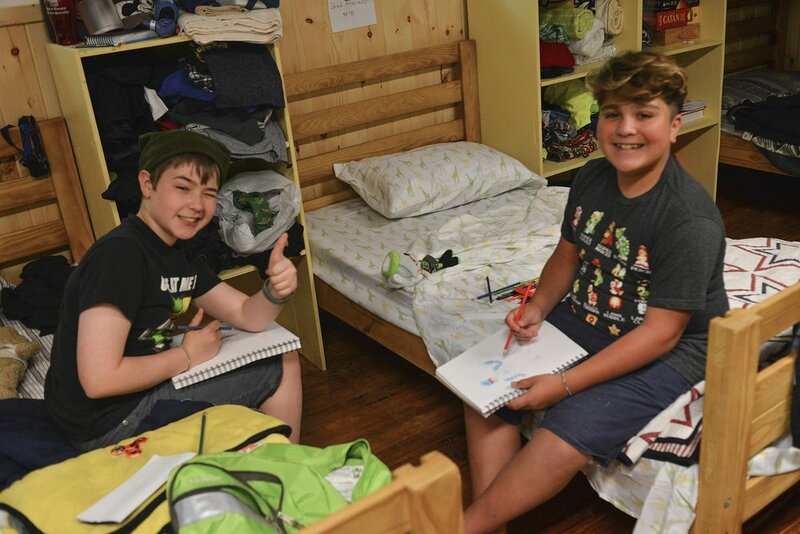 Mail is delivered to the campers daily and they look forward to receiving letters from relatives and friends. Packages are exciting for campers to receive. When sending a package please remember to send small toys, books, magazines and other items, but no food. Also, keep in mind that mail takes several days to get to us, so sending packages and letters early in the session is important. You could even send something a day or two before the camper arrives and they will get it on the first Monday of the session. Parents may send emails to their camper through a service called BUNK1. It is an outside vendor and they charge a registration fee and a small amount for parents and other relatives to send emails. (Campers do not have the ability to send emails home.) Using this service, parents also can log on daily and look at the many pictures that we upload to the Bunk1 site which is free to do. You will be able to see what we do each day and hopefully see a smiling picture of your camper. You will receive information from us about Bunk1 in the pre-camp mailing and on opening day. The address for letters and postcards is: Camper’s Name, Camp Nejeda, PO Box 156, Stillwater, NJ, 07875. The address for packages is: Camper’s Name, 910 Saddleback Road, Stillwater, NJ, 07875. Once you know your camper’s spec number (Health Center number), please add it to the address. Q: Can parents call to inquire about their camper during the session? A: Yes. For information about bloodsugars, parents may call the Health Center at 973-383-8556. Please be aware that the Health Center answers most of the day and evening except for meal and insulin times. Parents also may call the camp office and ask for the Unit Leader to see how their camper is enjoying camp and socializing. That phone number is 973-383-2611 and usually is answered from 9 to 5 except for lunch time.If you get the answering machine, please leave a message and someone should call you back within 24 hours, or try calling again. Q: Do campers take any off-site trips during their stay at camp? A: Our two-week session campers may elect to participate in a Delaware River Rafting Trip and an Appalachian Trail Hiking Trip. There is an extra charge for these trips which is collected when campers sign up during in-take on the first day of camp. The river trip costs approximately $40 and the trail hike costs approximately $20 and may paid by cash or check. The campers are transported by school bus, and are accompanied by counselors, nurses, and lifeguards. Also during our two-week sessions, all campers, counselors, and medical staff go on an outing to a water or amusement park. The schedule is as follows: Session 2: Mountain Creek; Session 3: Camelbeach; Session 4: Dorney Park. The cost of these trips is included in the camp fee. Q: Do campers need spending money at camp? A: During one-week sessions, the campers have no need for money at camp and parents are strongly urged not to leave money with their campers. The camp store is only open on in-take and out-take days when parents are present. 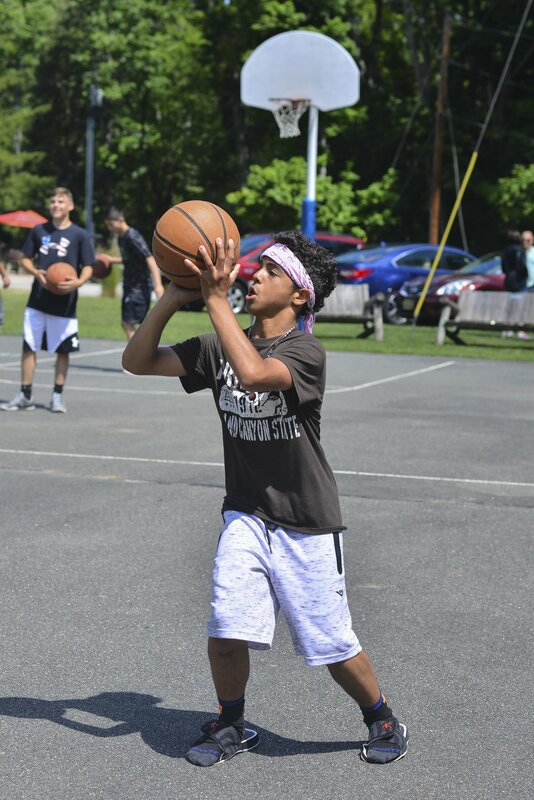 During two-week sessions, the campers have the opportunity to purchase snacks, souvenirs, and play games when attending the trips to Mountain Creek, Camelbeach, and Dorney Park. Spending money for these trips will be collected during in-take, kept safely in the camp office, and given to the campers at the park. An amount between $25 and $50 is usually sufficient. Leftover spending money will be given back to parents during out-take on the last day of the session. Q: Do campers have the opportunity to do laundry at camp? A: Though campers do not have access to laundry facilities while at camp, parents may sign their camper up for a laundry service during in-take of each two-week session. For a charge of $10, five changes of clothes and four sets of towels will be collected on Saturday mid-session, laundered off-site, and returned on Sunday. The fee for this service will be collected by cash or check during in-take. We strongly suggest that all clothing be labeled with the camper’s name. This service is not available during one-week sessions. In the event that a camper has an accident overnight, the Unit Leader will launder soiled bedding and night clothes discreetly. Note, we do not have the ability to launder sleeping bags and there is not enough time to launder soiled items on the last day of camp. Q: Is it necessary for my camper to have a sleeping bag if I am already sending him/her with blankets and bedding? A: Weather permitting, we try to arrange a sleep-out during our two-week sessions. During our one-week sessions, we also try to sleep out under the stars until around midnight depending on the weather. Therefore, if you have a sleeping bag, it would be best to bring it to camp. If you do not have a sleeping bag, we have some that can be used if needed. We do not recommend campers use the sleeping bags in the cabins instead of sheets and blankets because we do not have the facilities to launder soiled sleeping bags. A: Yes, we try to make arrangements for you to pick up your camper and bring them back to camp for important family functions, appointments and emergencies. We ask that parents be aware that this can be disruptive and only done when necessary. Please call the main office at 973-383-2611 and ask to speak with the Camp Director who will coordinate the specifics with you. Q: Are counselors allowed to accept tips? A: Yes, tips are greatly appreciated by the counselors. All of our counselors are in high school or college and have opted to spend all or part of their summer working with our campers. There are four counselors assigned to each cabin, so splitting the tip by four is ideal. Q: Do I need to bring my own diabetes supplies to Family Camp? A: Yes, families are asked to bring their own diabetes supplies. The camp will provide juice for evening low treatment, and the counselors will have backpacks stocked with glucose meters, glucose tablets and crackers for daytime low treatment.